U.S. President Donald Trump and North Korea's leader Kim Jong Un sign documents that acknowledge the progress of the talks and pledge to keep momentum going, after their summit at the Capella Hotel on Sentosa island in Singapore, June 12, 2018. 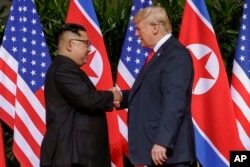 In an agreement signed Tuesday in Singapore, North Korean leader Kim Jong Un “reaffirmed his firm and unwavering commitment to complete denuclearization of the Korean Peninsula,” while U.S. President Donald Trump “committed to provide security guarantees” to North Korea. “We’re going to denuke North Korea,” Trump told VOA contributor Greta Van Susteren. “You know that could have ended in a war, that could have ended with many millions of people — you know North Korea very well, Seoul has 28 million people, that could have ended with millions of people dead but we ended with a deal,” he said. As for verification, Trump said he and Kim discussed the issue and that monitoring denuclearization efforts would be achieved “by having a lot of people there.” He also predicted Kim would begin work right away to “live up to” the agreement. On human rights, Trump said Tuesday’s meetings only very briefly touched on the topic, but that the two sides would discuss it more in the future. When asked about thousands of people imprisoned in labor camps, Trump said he thinks he has helped them because things in North Korea will change. “I think they are one of the great winners today,” he said. U.S. President Donald Trump shakes hands with North Korea leader Kim Jong Un at the Capella resort on Sentosa Island, June 12, 2018 in Singapore. “Otto did not die in vain, he had a lot to do with us being here today,” Trump said. He also thanked the leaders of China, Japan and South Korea for their efforts in making Tuesday’s summit happen. 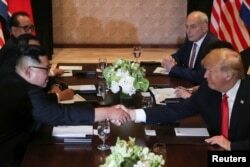 Both Trump and Kim expressed gratitude toward each other for the meetings.Trump said he would “absolutely” invite Kim to visit the White House and is open to visiting Pyongyang as well. U.S. Secretary of State Mike Pompeo speaks during a press briefing, June 11, 2018 in Singapore one day before President Donald Trump will meet with North Korean leader Kim Jong Un. The language in Tuesday’s agreement was not as strong as the CVID standard Pompeo set out. But the secretary of state still seemed positive about the outcome. “It’s a great day,” Pompeo told VOA. Reporter Bill Gallo contributed to this report.